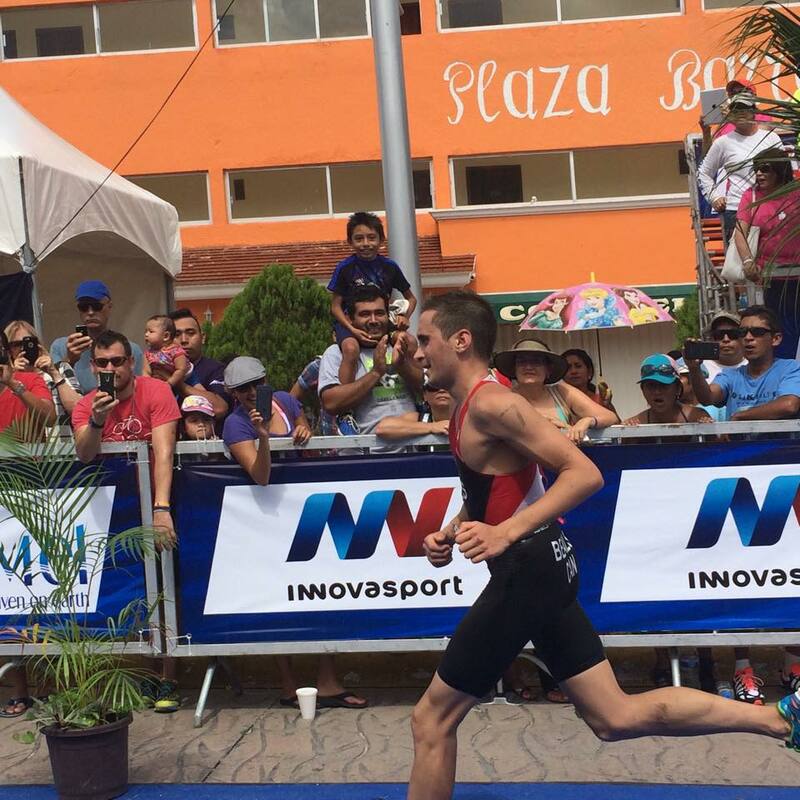 Earlier this year, I shared My Rookie Pro Triathlon Budget which offered a window into the finances of a first year professional triathlete. It became one of my most shared and well read posts. Many were surprised by my lean expenses, made possible by a minimalist lifestyle, and my equally limited earnings. 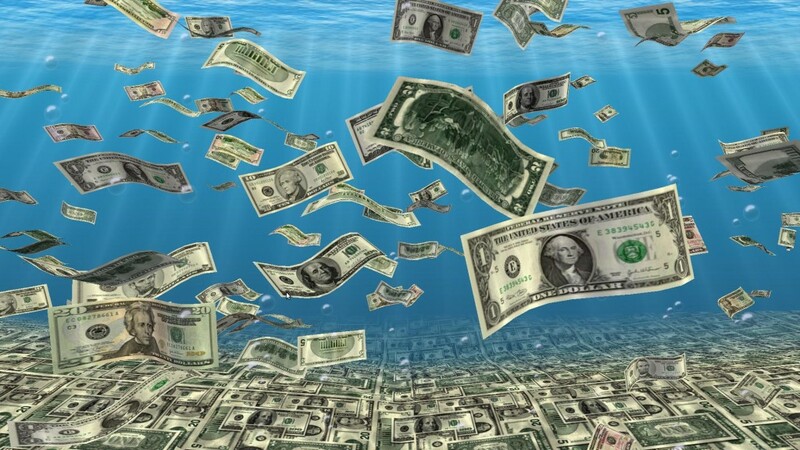 If you haven’t already read that post, I’d recommend starting there to find out about the financial realities faced by many neo-pro triathletes. Another year is on the books and I’m grateful to still find myself housed, clothed and fed as a professional triathlete (though still exercising restraint with the hookers and blow). It was a good year. 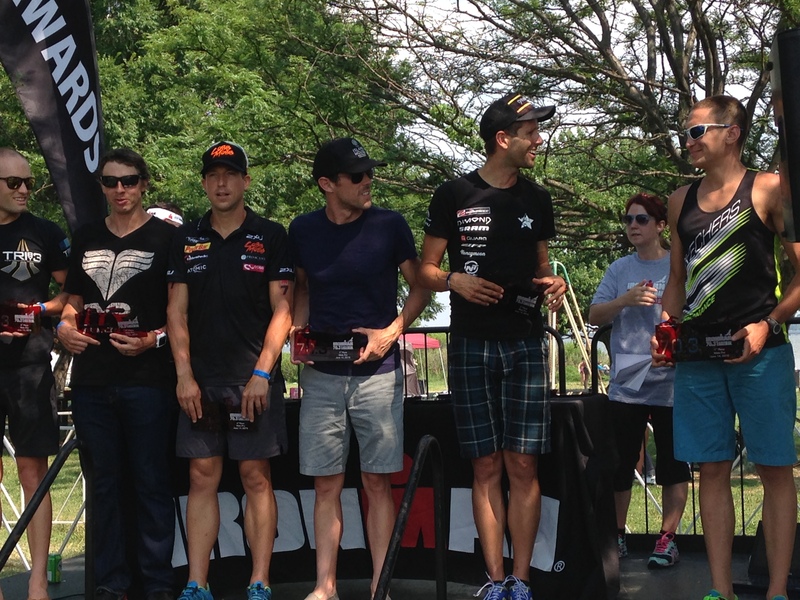 I cracked the podium at five Ironman 70.3 races and took home a paycheck at all but one race. Coupled with increasing sponsorship, I more than tripled my revenue from triathlon compared to 2014, while my triathlon-related expenses increased by about sixty percent. I managed to earn a little more than the median individual income in Canada and met my goal of supporting myself entirely by scampering around in spandex. Revenue, expenses and profit from triathlon over my first two professional seasons are summarized below. Throughout this post, I’ll present dollar figures in both Canadian (C$) and US (U$) dollars (converted at the average annual exchange rate) since most of my revenue and expenses are in US dollars though my home is in Canada. Jordan Rapp, ever the consummate pro, kindly explaining how to order a proper podium shirt like his. Photo: Angie Van Berkel. Falling 23 seconds short of the win at 70.3 Cozumel after a brutal chase cost me over C$8,000 or about $350 per second. Such is racing. Photo: Marianka VC. Like my rookie budget, this budget strictly includes triathlon-related revenue and expenses, and not my living expenses or my modest earnings from consulting work and investments. It also omits the considerable cost of food beyond the caloric needs of a NARP (non-athletic regular person). My top three largest single expenses were coaching (which more than pays for itself), the Ironman professional membership (U$848) and a Quarq power meter (U$810). Travel expenses include a few flights that were later reimbursed by sponsors. I didn’t track my non-triathlon expenses as meticulously, but I’d estimate that I spent roughly C$6,500 on rent and food and no more than C$2,500 on hooke— … entertainment and other incidentals. I rent a small loft in rural southern Ontario from some pretty chill landlords (Mom & Dad). They didn’t charge me rent for the three months I was abroad training and racing, which I mostly spent couch surfing with some amazingly giving strangers-turned-friends. Despite torching an average of well over 4,000 calories per day, my food costs are also low thanks to a mostly vegetarian diet that is heavy on inexpensive staples and light on restaurant meals. Professional triathlon offers nothing in the way of job security and more than a few career ending pitfalls, so I’ve continued to keep my foot in the door with a boutique environmental consulting firm. I could pursue a satisfying career in that field, but I’ve tumbled deeper down the rabbit hole that is triathlon every year. Comparing my 2015 triathlon earnings to a 40 hour consulting workweek amounts to a 60 to 70 percent pay cut, something I try not to get hung up on. 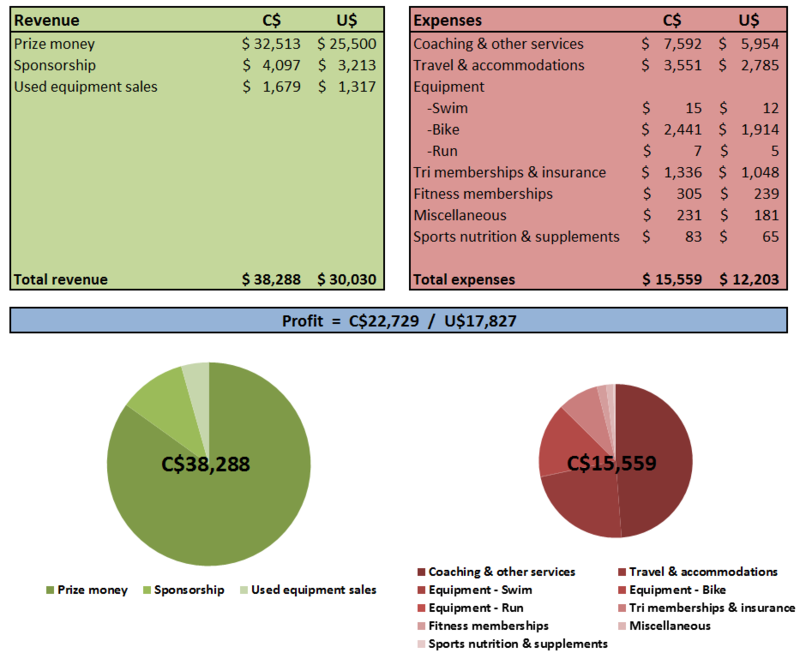 The majority of my triathlon income (85%) came from prize money, broken down by race below. 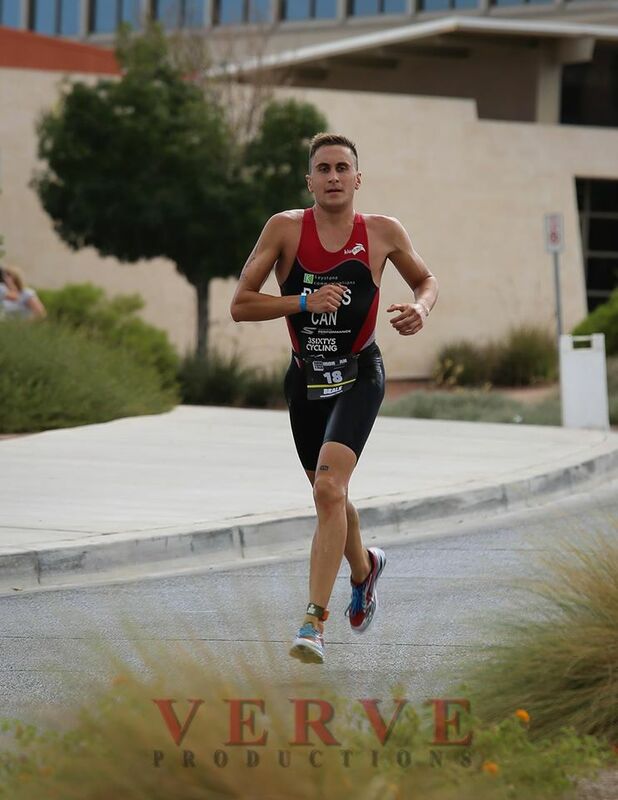 I raced eight Ironman 70.3 races between early April and late October, my longest season ever. I capped off the season with a rampage of racing—four races in eight weeks in three different countries. This schedule was largely financially motivated. The last two races in particular, Silverman and Los Cabos, were all business and not much fun as I nursed an injury and growing fatigue. I hobbled off my last red eye flight home with a pulled hip flexor, bruised foot and nasty cold that laid me up for weeks, thoroughly trashed but satisfied that I’d got the most out myself this season. On the struggle bus at 70.3 Silverman. Many, if not most, athlete-sponsor relationships involve product only (in-kind) sponsorship, especially in the case of developing or lower-tier elite triathletes. Offsetting the high cost of triathlon gear is certainly helpful, however Visa doesn’t accept bartering with compression socks. Earning a living as a professional triathlete requires financial sponsorship given the sport’s limited prize money. This can take a few different forms. A couple of my sponsor contracts included modest bonuses for podiums or wins at major races, which netted me C$670 in 2015. I didn’t do too well in this department. Well-established pro triathletes earn a good deal more from such bonuses, which may even exceed total prize money. Developing these arrangements with sponsors takes time, persistence, a solid resume and not taking no for an answer strong negotiating skills. I expect to earn at least ten times more from performance bonuses for comparable performances next season. Another common form of sponsorship is a travel allowance. Three of my sponsors either booked my flights directly or reimbursed me for airfare costs, eliminating this large expense. Travel allowances weren’t written into any of my contracts this year, so this mostly came as a pleasant surprise. A fourth and least common form of financial sponsorship is no-strings-attached money. That is to say, cold hard cash that isn’t a performance bonus or earmarked for a specific expense. When such payments are recurring, they’re usually referred to as a stipend. I received C$1,115 like this, which is much appreciated to help cover the myriad of other triathlon expenses. Unfortunately, delayed or “forgotten” sponsor payments are not uncommon. I was on the (non)receiving end of this for the first time. After fulfilling all my contracted responsibilities and then some, I’ll likely never see a cent owed by a certain ex-sponsor. This was a hard lesson that verbal agreements do not suffice when there’s money on the table. As I said in my Rookie Budget, sharing my finances is sure to trigger mixed reactions. Some will lament the state of professional triathlon. Others will wonder why I left a dependable, six figure income in favour of an uncertain uphill struggle to become a world class triathlete. Still others will think it’s pretty damn cool that I get to travel the world, developing oversize quads, signing babies, peeing in cups in front of strangers, and whiling away the days napping, creeping Slowtwitch.com and polishing my medals. That’s the positive attitude I try to adopt. After two decades in endurance sports and the better part of a decade in triathlon, I’m grateful that I can finally earn a living doing something so unconventional, challenging and thrilling. Thank you to everyone making that possible, from my greatest supporters to my newest followers.